If you ever wanted to be a wine expert, you need to know and master the basics first. 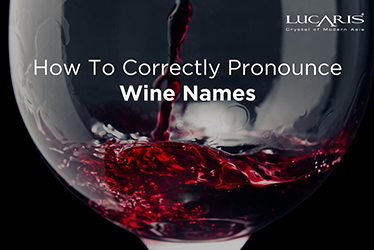 Knowing grape varieties and wine regions are the most basic that all wine beginners and wine lovers should know. 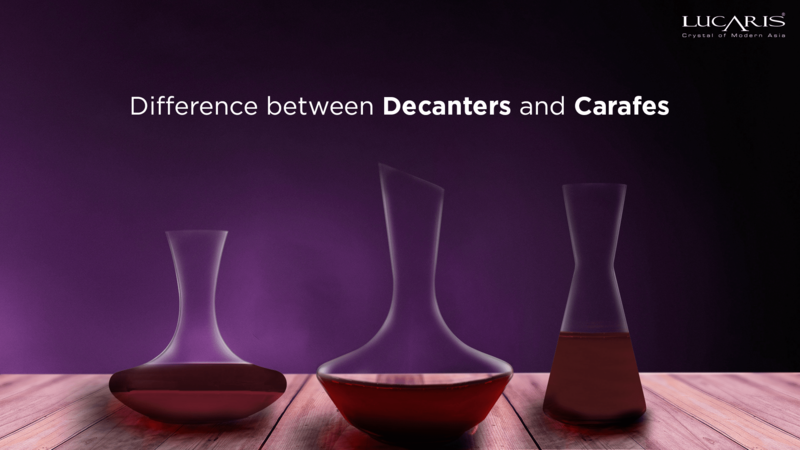 This is because both will help you be able to analyze characteristics of wines and labels on wine bottles. Believe it or not, there are many wineries all around the world. However, more than 80% of them are exported from France, Italy, Spain, America, Argentina, Australia, Germany, South Africa, Chile, and Portugal. 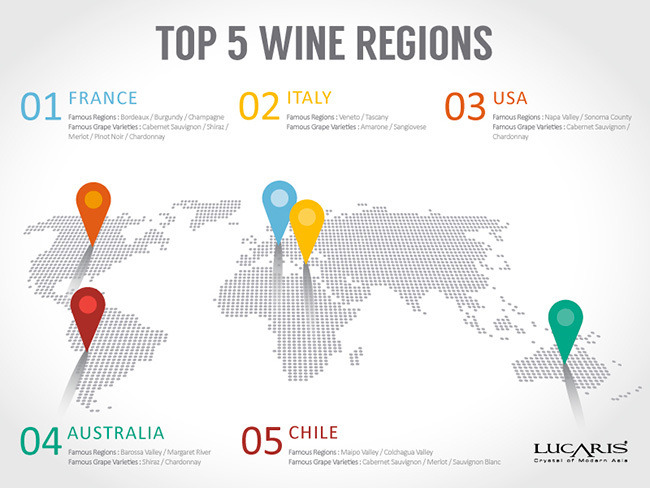 We are excited to present and guide you to the top 5 wine regions that you should know to even further your wine knowledge! One thing that many of wine experts would think of when it comes to a country that has the most famous wineries and their techniques/styles become very well-known and use all over the world. That’s right, It’s France! France is one of the country that produces wine the most on earth. The amount that is yearly made by this country is approximately 5000-6000 million liter or around 7-8 billion bottles. Not to mention that classic brands like Cabernet Sauvignon, Shira, Merlot, Pinot Noir, and Chardonnay are originated in France. Also, very famous wineries such as Bordeaux, Burgundy, and Champagne are reside in France as well. You can call Bordeaux as the biggest winery in France. This region produces almost 700 million bottles per year which 98% of products are red wine. The famous wine from this region uses varieties of grapes such as Cabernet Franc, Merlot, and Cabernet Sauvignon blend together to create the Bordeaux blend wine and dessert white wine is a second famous from Sauternes. Burgundy is a region that has very high quality of winemaking. Many of its vineyard are ranked in Grand Cru class. Famous wines from Burgundy are usually dry red wine and white wine which make from pinot noir and chablis respectively. Champagne locates in the northeastern part of France and very famous in sparkling wine production which later became widely known all around the world. Interestingly, sparkling wine sometimes call champange only if it is produced in Champange. Italy is another country that produces old world wine mainly. Italy wine production rate is around 4,500-5,000 million liter per year and considered to be one of the biggest wine exporters in the world. Not only that, Italy acutally has a very high rate of wine consumption as well, approximately 42 liters per person! Thus, 1 million acre of vineyard including Veneto and Tuscany locate all over Italy are dedicate to maintain all of italian wine lovers. One-third of wine production in Italy comes from Veneto. This region has advantages of coldness from the Alps and warmness from Adriatic sea and therefore able do various types of viniculture. Featured wines from Veneto include white wine Soave and red wine Amarone. Tuscany locates in the central part of Italy that closes to the Tyrrhenian sea. Many of well-known wineries such as Chianti, Brunello di Montalcino, and Vino Nobile di Montepulciano are also in Tuscany. The most famous grape in Tuscany is Sangiovese and signature wine is sweet wine Vin Santo. The United States of America is ranked below France, Italy, and Spain in wine production. Unexpectedly, 90% USA’s wine comes from California state that has famous wineries such as Napa Valley and Sonoma county where Cabernet Sauvignon and Chardonnay are the most pick grape varieties. Wines from Napa Valley are famous from their premium quality. This due to weather conditions, geology, and topography which are similar to those in the Mediterranean, enable Napa valley to grow varieties of grapes. Sonoma County is another province that vinicultures the most in the United States of America. Mountain range climate conditions and fertile soil in Sonoma county are perfect for grape variesties such as Cabernet Sauvigno, Chardonnay, Pinot Noir, Sauvignon Blanc, and Zinfandel. In Australia, wine isn’t just a beverage but it is actually a massive industry that stimulates the country’s economy, employment rate, and tourism. Australia produces approximately 750 million liter per year. Unfortunately, only 40% of the population consumes wines. The main grape varieties of Australia are Shiraz and Chardonnay. For anyone that is a fan of Shiraz grape must at once try Shiraz red wine from Barossa valley in his or her life time. 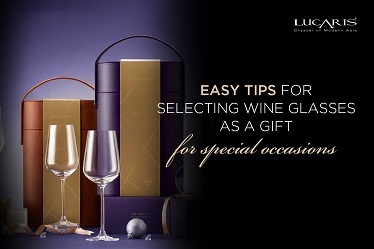 Shiraz red wine comes with full-bodied taste, slightly spicy, and chocalate fragrance. Because of it, Shiraz red wine is now internationally known and Barossa valley is considered to the best winery in Australia. If you are looking for a premium mine. You need to look for wine from Margaret river because more than 20% of premium wine from Australia is produced from this area. Featured wine from Margarent river is Bordeaux red wine from Cabernet Sauvignon grape. The last country that is considered to be the biggest wine exporter is Chile. The charm of Chilean wines come from the perfect mix of France and Pacific coast weather conditions.The must try wines when you are in Chile are Cabernet Sauvignon red wine, Merlot red wine, and especially Carmenere red wine from Carmenere grape that is originated in Bordeaux, France but rarely can be found nowadays. Maipo Valley locates in the southern part of Chile’s capital city. Cabernet Sauvignon red wine is extremely famous and has a world class quality. Maipo valley is divided into 3 parts: Central Maipo, Pacific Maipo, Alto Maipo; and because of its fresh air and dry condition, this will help bring out the freshness of wine. Colchagua valley has similar climate as the Mediterranean and is slightly colder than the Maipo valley. Featured grape varieties include Cabernet Sauvignon, Merlot, Chardonnay, and Sauvignon Blanc. In addition, Colchagua valley is considered to be the “Napa valley” of Chile. After we have learned all about the “Top 5 Wine Regions” that many of wine beginners must know. 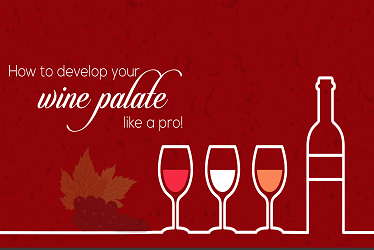 You should be able to roughly classify styles and characteristics of wines that are in your interests. 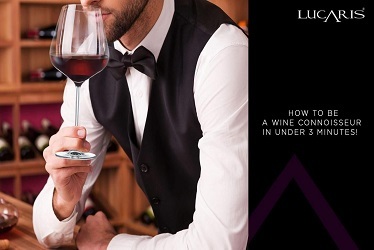 Nonetheless, this is just a small essence of wine basics. 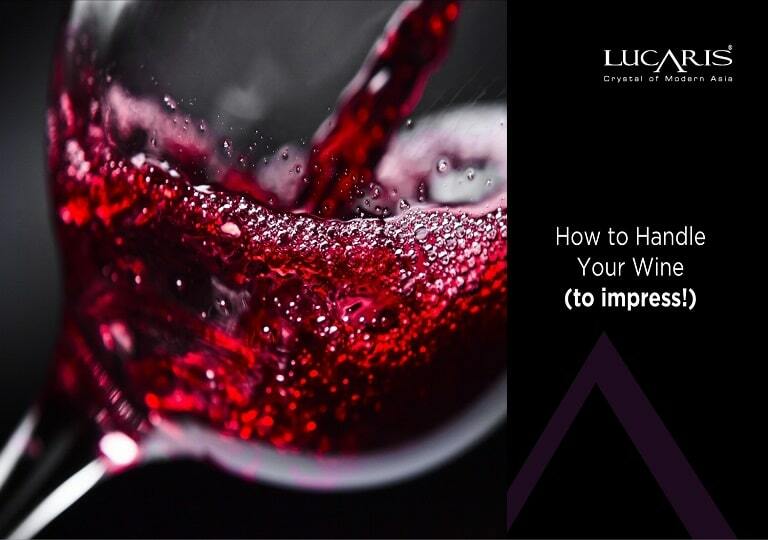 If you would like to expand your horizon in the wine world, there are more articles written by us such as Wine Basic : Grape Varieties and Importance of Choosng a Wine Glass for a Specific Wine.